Driving through beautiful Creve Coeur Lake Memorial Park in St. Louis, you could be forgiven for thinking you’ve stumbled across an Ewok village. 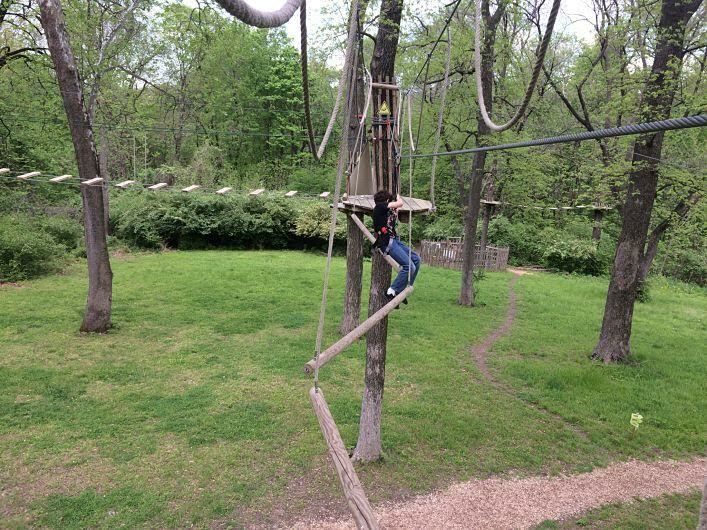 Actually, it’s Go Ape-St. Louis, an aerial obstacle course with ziplines. Our treetop adventure began with check-in at the red barn, where the attendant holds keys, wallets, and phones behind the counter for safe keeping. Before we headed out, a guide took us through safety training. 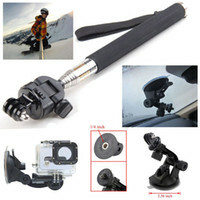 Participants are responsible for securing themselves to the lines at every point during the adventure. That sounded intimidating to me, but the training was straightforward and thorough. We started with a ground-level mockup of the safety systems used throughout the course, including the instructional signage posted at every crossing. Once the guide had checked our comprehension, we walked to the first station. It is low to the ground; for those who are unsure if they’re going to be able to handle the experience, this serves as a test site. If, after going through this first station, you don’t want to proceed, Go Ape offers a refund. None of us quit, though. We went through one at a time so the guide could ensure we knew what we were doing. Then we were released to explore the course at our own pace. Think of Go Ape as an aerial obstacle course. Each site begins with a rope ladder and ends with a zipline, but in between, we navigated bridges, swinging platforms, hanging rings, and more. (You do get a rest between—there are platforms between every component). As our guide said, what makes this fun is having to earn the zipline rides. Obstacles are rated from easy to extreme, and any time there’s an “extreme,” there’s also an easier option. We took all the “extreme” paths, and I found it more physically demanding than I had anticipated. But I never felt in danger or even particularly aware of the height, because at all times, I was tethered to a safety line. I knew if I lost my balance, I’d only fall a foot or two at most. In fact, most of the time you can choose to take the easy way out and glide from one tree to the next, using the safety harness. But where’s the fun in that? 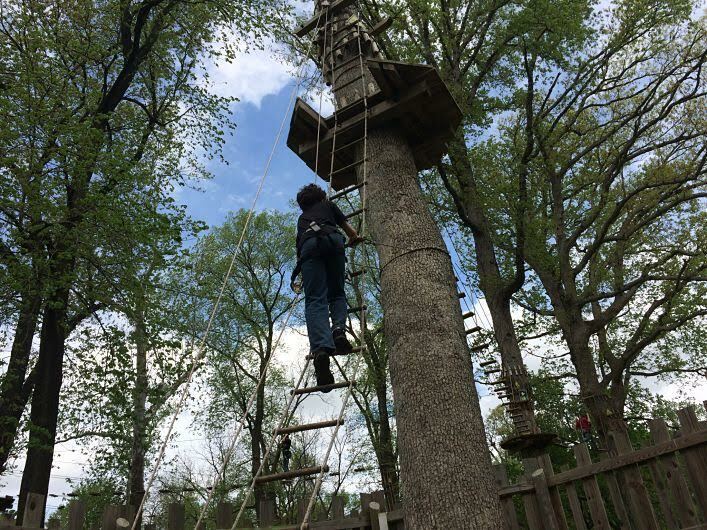 Note age limits: Although some Go Ape locations have a course for younger kids, St. Louis does not—yet, at least. Here, it is open to ages 10 and up. One adult (18+) must be in the treetops for every two children ages 10-15. 16-17 year olds don’t need a chaperone on site, but they will need a waiver signed by a parent or guardian. If your family is like mine, your spouse and most of your kids wouldn’t touch an aerial obstacle course with a ten-foot pole. Never fear. Adjacent to the red barn is a spray park and a really nice playground. And if the family wants walk along at ground level and watch their more adventurous counterparts, they can do that, too. You’ll also find employees roaming the course to offer support and suggestions to those in the treetops. The rope ladders at the start of each site are enclosed within a locked fence; you have to have a code to enter. Inside, Go Ape provides water and paper cups as well as educational signage about conservation, endangered species and information about the trees and undergrowth surrounding you. A treetop adventure lasts 2-3 hours. But because Go Ape partners with state and local parks, there’s always more to do in the immediate vicinity. In St. Louis’ Creve Coeur Memorial Park, you can supplement your treetop adventure with fishing, kayaking, canoeing, dirt biking, or disc golf. Wear jeans and sneakers, and bring gloves. You can go without, but your skin will be happier if you have them. If you forget, Go Ape sells gloves on site. Hours vary, but Go Ape is generally open March through November. Your best bet is to book online ahead of time. Walk-ins are accepted, but having a reservation guarantees a spot when you arrive. Check out their FAQ page to get more details. Go Ape is located at 13219 Streetcar Dr., Maryland Heights, MO 63043. Parking is free on site. My son and I enjoyed our treetop adventure as guests of Go Ape, but our enthusiasm for the experience is all ours.